Bellagio is the name of a beautiful small town that lies on the popular Lake Como in the Lombardy region of Italy. It is also the name of one of the most beautiful casinos in America’s Sin City – Las Vegas. 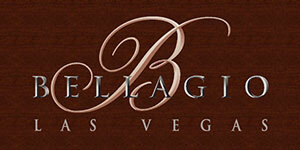 Bellagio Casino Resort was opened in 1998 and it was renovated three times, in 2004, 2006 and 2011. With more than 10 restaurants, a dozen clubs, bars and loungers, as well as a range of other amenities, Bellagio definitely has a very rich offer that will please even the pickiest visitors. The hotel has almost 4,000 and is one of the largest hotels in Vegas and beyond. The gaming area is 116,000 square feet large. Bellagio is owned by MGM Resorts International, one of the largest casino groups in the world. Casino fans can enjoy a range of activities, including the inevitable slots, they can also play poker in one of the numerous rooms, bet on sporting events and horse races and those that plan on becoming frequent visitors should apply for a Rewards card which will give them access to a lot of benefits. In addition to earning comp points with every wager you make, you will also be able to benefit from a lot of Freeplay promotions and other perks. When it comes to Blackjack you will definitely not disappointed, as there are several 6-deck varieties, as well as double-deck Blackjack. This is one of the two main variants at Bellagio. In this version you are allowed to re-split aces, to double after a split and the option of surrendering is also available. The dealer is supposed to hit on soft 17 (ace and six). The wagering limits can be as low as $10, $15, or $25, but there are also tables with higher minimum wager and the maximum amount that you can bet is $10,000. The limits may depend on the time of the day or the day of the week. During the mornings the limits are usually lower, whereas during weekends the bar is raised higher. The house edge for this variant is 0.48%. This version is very similar to the one described above. The rules are pretty much the same, you can re-split aces here as well, you can surrender and doubling after splitting is permitted. The only difference here is that the dealers are supposed to stand when they have a combination of an ace and a six. 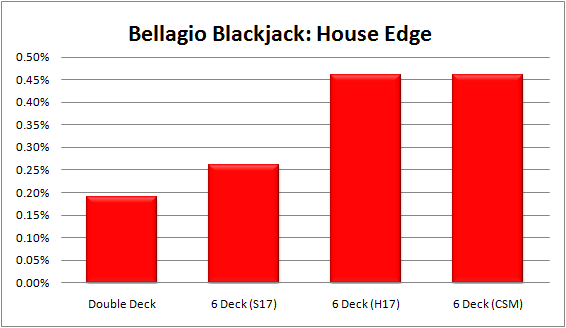 That rule makes this game one of the most favorable versions of Blackjack, as the house edge is only 0.28%. The house edge is slightly higher and here you’ll find that the minimum bet size is $25, but it can be as much as $100 during weekends. The maximum wager is $10,000. This version has a similar set of rules as the previous two, the dealers need to hit when they have a soft 17 and players are allowed to surrender, double after splitting and re-split aces. There is only one difference and that is that the cards are shuffled constantly. That makes card counting impossible, but the table limits are significantly lower and here you can play Blackjack with as little as $5. It is often said that the lower the number of decks that are used, the more favorable the game is for the player. That is true and at Bellagio you can also play double-deck Blackjack. Here you can’t re-split aces and you can’t surrender, but you can still double down after splitting and the dealer is supposed to stand on soft 17. There are 8 double-deck tables, but you can surely understand why this variant is demand. The house edge is pretty low at about 0.22%. This game is more suitable for high rollers as the minimum wager is never below $50 and during weekends it is usually $100. The maximum stake amount is $10,000. Recently, Bellagio introduced Blackjack Switch, thus becoming one of the several Vegas casinos that include this intriguing variation in their Blackjack portfolio. If you’re not familiar with Switch, it is a game where you’re dealt two separate sets of two-card hands and you are permitted to switch cards. This makes the game a lot more favorable for the player, so that is why two additional rules are also introduced, the payout for Blackjack is just 1 to 1 and a dealer’s hard 22 is a push and not a bust. The maximum stake limit at Switch is lower compared to other variants. Bellagio is a very busy and famous casino, therefore it is not that difficult to go unnoticed, even if you’re counting cards. Moreover, the house edge on both the double-deck and the six-deck games are quite good, which means that you can expect to make a profit if you’re a skilled card-counter. However, if you get too greedy, you might be politely asked by a member of staff to leave the casino. Furthermore, you should not be surprised if they know your name. Once the stuff suspects that someone is counting cards they will pay attention to them and their style of play and if you win a significant amount of money in one session you will be discovered. It is a classy establishment though, so even if you get caught, you can expect their employees to be very polite. Bellagio is one of the most iconic casino resorts in Vegas and it is hard to find anyone who has visited Vegas and didn’t feel the urge to enter Bellagio. There are over 65 Blackjack tables and the odds are one of the most competitive in all of Vegas. If you visit during the mornings of working days, you’ll get to play with lower wagers, whereas if want to play during the weekends you’d have to be ready to spare at least $50 per hand. In summary, this casino has a pretty solid Blackjack offer. * The taller the RED bar, the worse your odds are. Whether counting cards or not, Bellagio is one of the very best casinos in the world for blackjack. Bellagio has 8 double deck tables offering S17 and good dealer penetration. You’ll also find that all the high stakes action will allow you to play black chips without drawing much attention to yourself. The 6-deck shoe games are also very good. They offer all the best blackjack rules (S17, DAS, RSA, LS) and decent penetration. Again, as with the double deck, the fact that a lot of money runs through Bellagio will allow you to get plenty of large bets out on the table without getting much heat from the pit. Bellagio is easily one of my favorite places to play blackjack.